Landlords! That word definitely can have a bad connotation. This post is written for the benefit of all of you out there that have to deal with pets and landlords. It's a pretty simple concept. Landlords want their apartment/house/condo back in relatively the same condition it was given to you in. This doesn't include chewed cabinets or curtains that were used for tug toys. A little wear on the carpet is to be expected, but your Mastiff's accidents may not fall into that category, unless they are completely cleaned up. I'll address clean up in a later post, but for now, let's talk about what you need to do to keep that landlord happy. Protect the carpeted areas with throw rugs, dog beds, crates and furniture, to the extent possible. If Spot favors a particular area of carpet for napping, come up with an ingenious plan for covering it (a rug!) or redirect him to another area with a bed, toys, chewies, etc. If you praise and treat him when he goes there, you'll soon find you won't have to ask him. 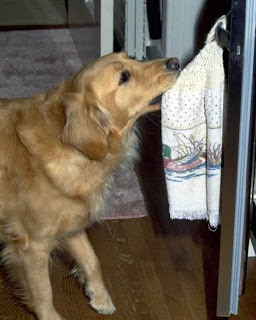 Give your dog's water bowl a vinyl placemat, to keep the floor clean and dry. This will help you avoid mold and mildew in the tile grout or discoloration of the vinyl flooring. You can pick these up at most pet stores. Choose one with a lip that will collect overflow for easier clean up. If you have a drooling dog (all you Mastiff owners know who I'm talking to! ), you'll find there is a line of his 'sling' at the level of his head. A rag and some vegetable soap (I like Dr. Bronner's) in warm water will help you clean up the walls once a week, and will only take a few minutes per room. Bath time in your tub will work fine if you have a small or short-haired breed. Chow Chows need not apply; go see your neighborhood groomer. The down side of an indoor bath is the to-be-expected SHAKE SHAKE SHAKE that is a natural reflex. All dogs will shake to remove trickly, tickly water after a bath or swim. Considering the clean up of mirrors, walls, floors, towels, etc., you may want to think about an outdoor bath with the hose, or at the groomer's will make it a whole lot easier on you. However, you choose to do it, just do it. A clean dog will not leave a dirty dog smell in the carpet, something that could end with you not getting your security deposit returned when you move. That might put it in perspective. Stay on top of flea treatments to assure you are not growing a population of these bouncy pests that will attack the next family to move in. This could punch you in the wallet also. Ditto for ticks. As you do your regular dog grooming routine of brushing, ear cleaning, etc., include a good massage that will allow you to feel his skin for any freeloaders that have moved into his fur. Remove by grasping with two finger nails and pulling out perpendicularly. If you find more than a couple, I suggest you read No More Ticks for Tanner, and take action accordingly. Better safe than sorry, as these parasites can carry diseases that you and your Rover don't want to deal with. Crate train your puppies and maintain a crate-lover throughout his life. You won't regret the space a crate will take up when your senior dog needs a safe place to retreat during a thunderstorm or party, or just a quiet napping spot on a lazy afternoon. I've even had repairmen ask me to crate my dogs just because they are large. Provide your dog with plenty of busy bones, chew toys, filled Kongs, and boredom busters of all kinds to assure he won't take out any frustrations on your shoes or your landlord's cabinets. A daily walk for 30-60 minutes will go a long way toward tiring out Rover. A napping pup is 100% less likely to get into trouble than one with pent up energy who is looking to let it all out. Will it be your couch, a table leg, your Coach handbag, or maybe the window-treatments? If at all possible, arrange for a mid-day potty break for your pup, while you are away at work. Perhaps a neighborhood teenager or friend can help out. You can repay them in kind by helping them with their dog, when they go away. Fostering these kinds of reciprocal dog-sitting arrangements can be a money-saver for both of you, while keeping Fido comfortable and giving him a chance to stretch his legs. Besides saving your security deposit, these tips will assure you get a good recommendation from this landlord, when it's time to move. That simple act on the part of your landlord will give your more options to choose from, and hopefully that will be a Win-Win for you and your dog. Maybe your next home will have a big, fenced in back yard for lots of fun playtime. Happy tails!